Especially designed to be compact and easy to operate. A mid range twin brush machine with a built-in charging system. Has a big 60-litres capacity and exceptionally stable 65cm single brush scrubbing head. The Truvox Multiwash ideal for almost every kind of floor surface. Scrubber Dryer Detergent is a low foam scrubber dryer floor cleaning detergent. This is an easy to use product that can be applied manually or with the use of a scrubber dryer. The Scrubber Dryer Detergent is a heavy duty detergent that removes difficult soils such as oil and grease from hard floor surfaces. It is available to buy as a single product or as part of a bulk buy option. The RSD 30/45E is a heavy duty mains powered scrubber dryer for wet scrubbing and drying in one operation on hard floors, including wooden, tiled and Altro safety flooring. 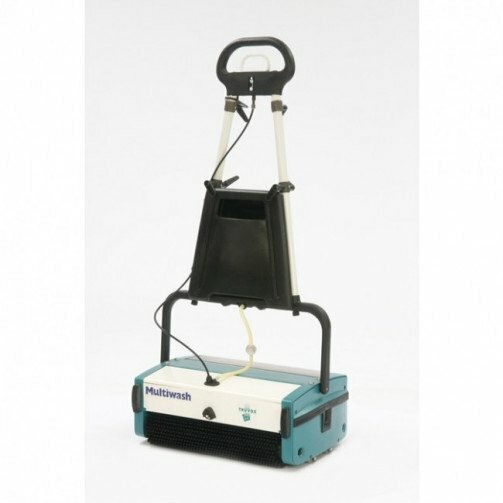 This compact and manoeuvrable battery operated scrubber dryer is ideal for small to medium sized areas in restaurants, schools, leisure centres and healthcare premises. The Numatic TwinTec 1840 battery floorcare machine has been engineered to reduce size whilst maximising performance and handling. Lindhaus LW30 and LW38, small, light and easy to use. This is a revolutionary NEW scrubber dryer that will save you time and money. Battery Powered. Compact and easy to store. Quicker and more efficient than moping. Contact us for FREE demonstration. Easy to use Ride-On scrubber Dryer. New compact scrubber dryer CRO8055. Compact and user friendly scrubber dryer. Available with a battery pack or cable. Icemop is powered by a lithium ion battery, for easy and fast recharge at any time. In this way the machine is always available during the whole day and, being lightweight. it can be used for more interventions in different places. Numatic NuTab Low Foaming Tablets. These tablets are placed in your scrubber dryer whilst cleaning, they reduce the amount of foam produced from previous carpet stains, that may have been quckly treated with washing up liquid and water or other foam based products. Foam can seriously damage a scrubber dryer when sucked up in to the machine, this is why we recommend that you purchase these to use with your scrubber dryer. Each tub contains 9 packs of 10 NuTab Tablets. Introducing the brand new Numatic Henry HGB Scrubber Dryer, here at Janitorial Direct were offering the opportunity to purchase the HGB Scrubber Dryer ready for delivery on his Official Launch Date mid-June 2017. The Numatic HGB Scrubber Dryer has easy to use red touch control panel, with a battery and hour meter and tilting deck for easy brush change, making it more user friendly, and easier to determine how much run time you have left. The gel batteries have a 1.5 hour run time, meaning that you can achieve continuous cleaning without the hazard or restrictions of cables around your feet. One of the features of the Numatic Henry HGB Scrubber Dryer is the fully adjustable handle, resulting in the user achieving ultimate cleaning comfort no matter what height they are. The Structofoam chassis is designed to be incredibly durable and chemical resistant, as is the 30L Polyform tank; making it easier to clean after the job has been finished, and helps the structure of the machine last longer. The I-Mop XXL is the worlds most productive and efficient floor cleaning machine. Its impressive 64cm (25.6 inches) cleaning width combined with the patented I-Mop technology which combines the high power and performance of a large scrubber dryer but the mobility and flexibility of a floor mop effortlessly cleans all hard floor types both big and small. This amazing machine offers incredible productivity of 1600 sq/Mtr per hour which is over 4 times faster and 10 times more effective than mopping. The ergonomic cleaning system and two powerful counter-rotating brushes running at 350rpm with 26kg of down pressure ensures a deep and thorough clean every time, and allows you to manoeuvre the machine in and around obstacles . The XXL has a comprehensive range of accessories from deep clean brushes to Twister diamond pads so whatever your floor type the XXL will be a big performer. The quick change water tanks make filling and emptying this machine incredibly easy and increases productivity by 50% over machines with built in tanks which can prove a challenge in many environments. The XXL is one of the only truly continuous runtime floor cleaning machines as the innovative quick change click in click off design batteries offer 70 minutes runtime per charge and the re charge time is only 60minutes. With 2 sets of batteries this big performing machine will run all day long. Where high performance cleaning is needed then the all new I-Mop XXL is an absolute must. Its compact design and easy to use controls means the 3045 is easy to operate without any unwanted hassle! The Twintec single tank scrubber dryer is mounted to a full stainless steel chassis and comes complete with a 40 litre dirty water tank, 450mm scrubbing head and a one of a kind folding design that allows easy changing of the brush, transit and storage of the cleaner. Boasting fully sealed, maintenance free gel batteries with a run time of up to 2.25 hours and fully integrated on-board charger. • Easy to use controls - Now with red touch user friendly controls. • Gel Batteries - 10hr charge time. • Structofoam Chassis - New chemical resistant structofoam moulded chassis. • 30L Capacity - Polyform tank. • 45cm Scrub Width - Tilting deck for easy brush change. The Truvox Multiwash MW240 gives outstanding results - in just a single pass - on most types of hard floor coverings. The Truvox Multiwash MW240 leaves wood, PVC, studded rubber, lino, marble, granite, stone, quarry-tiles, profiled ceramic floors and non-slip safety floors clean and ready to walk on in just minutes. The all-in-one Truvox Multiwash MW240 machine can also be used on soft floor coverings including woven and non-woven short pile carpet, carpet tiles, and it can even be used on travelators, escalators or entrance matting. The compact proportions and 24cm cleaning width of the Truvox Multiwash MW240 make it even easier to maintain hygiene standards in more difficult to reach locations. The Truvox Multiwash MW240 has a solution tank capacity of 1.2 litres. The width of the cleaning area is 24cm. The machine has a 12 metre long high-visibility mains lead. The brush runs at an operating speed of 650 rpm utilising a 550 watt motor.